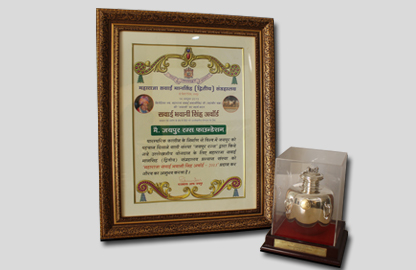 We are delighted to report that on the 82th birth anniversary of the late Maharaja Sawai Bhawani Singh, MVC of Jaipur, Maharaja Sawai Man Singh II Museum Trust graces "The Man behind Power of Looms", Mr. Nand Kishore Chaudhary with Rajmata Padmini Devi Award for his constant efforts in empowering the underprivileged class (mostly women) and facilitating research using quality driven technology in the rug industry. No one could imagine that two looms and nine artisans would be the smiling cause for 40,000 artisans across the nation. Cheers!